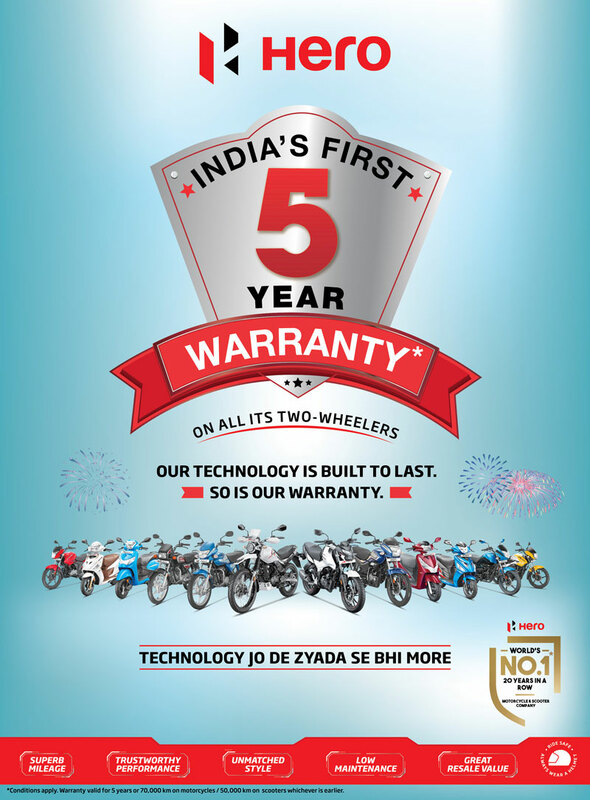 Warranty Details, Policy of Hero Bikes Services & Maintenance - Hero MotoCorp Ltd. Hero MotoCorp Ltd. (hereinafter called 'Hero Motocorp') warrants its motorcycles and scooters (hereinafter called 'Vehicles') assembled/manufactured in its Plants and sold through its authorized dealers, to be free from any defect - both in material and workmanship, under normal use and conditions, subject to the following terms & conditions. a) Hero MotoCorp warrants all its motorcycles for a period of 5 years or 70000 Km and scooters for a period of 5 years or 50000 Km, whichever is earlier, from the date of purchase. b) It is mandatory to avail all free and paid services from the Hero MotoCorp's authorized workshop(s) only, as per the recommended schedule, to be eligible for warranty benefits. Each paid service should be availed within 90 days from the date of previous service or as per the recommended schedule, whichever is earlier. c) If any defect is observed in the vehicle, Hero MotoCorp's only obligation/ liability is to repair or replace that part/ those parts which is/ are considered to be the cause of such defect, provided however that such defect has not resulted due to misuse/ improper handling etc. of the vehicle. Any vehicle needing repair should be brought along with Owner's Manual as well as Owner's manual-supplementary to Hero MotoCorp's authorized workshop(s) for necessary inspection and rectification job.